Of all the imagery being used to market watches, perhaps none is more overused than motorsports. Watch brands create special models that will be offered with high performance cars, they plaster their logos on racing venues, cars and drivers, and new watches pay tribute to champions, even long after they have passed away. The fact that a brand has history in racing is hardly an obstacle at all, as images of legendary races and racers are readily available for licensing. Against this cluttered landscape of brands claiming a pedigree in motorsports, TAG Heuer stands alone as the brand with the strongest connection to the golden age of motorsports. Back in the 1960s, racers wore Heuer chronographs, racing teams used Heuer equipment, and races and rallies were timed by Heuers. Andretti, Rindt, Villeneuve, Siffert, Bell and other racing heroes all wore Heuers, well before the era of paid ambassadors. Talk to the old-time racers, and they will confirm that the Heuers were the watches that everyone wore. So in the year 2013, how can TAG Heuer rise above all the noise at the racetrack, to secure its place as the watch brand most legitimately associated with motorsports? With the Heuer Carrera now in its 50th year, how can TAG Heuer capitalize on its racing pedigree, while offering watches that suit today’s styles? adding a complication that makes the chronograph useful at the track (and a little more fun to wear, just about anywhere else). Having worn a production model of the Carrera Calibre 36 Flyback for the past week, it’s time to explore these elements. But a watch is more than the sum of its elements and history; we also consider the experience of wearing the watch. The Carrera Calibre 36 Flyback chronograph has a traditional bi-compax layout, with running seconds at the nine o’clock position, the chronograph minute recorder at three o’clock and a center-mounted chronograph second hand. The registers have bright “Daytona rings”, consistent with the bright polished steel of the hands and markers. The date is shown at six o’clock; it’s large enough to read easily, without interfering with the layout of the dial. The chronograph operates in the conventional manner, the top pusher starting and stopping the chronograph, and allowing time-in / time-out operation. The bottom pusher resets the chronograph to zero. As we describe in more detail below, the “flyback” feature means that this bottom (reset) pusher can be operated while the chronograph is running or while it is stopped. TAG Heuer is offering the first Carrera Calibre 36 Flyback chronographs in three color schemes, the one that I wore has a stainless steel case with a sunray anthracite inner dial, with a bright white outer track (called “silver” by TAG Heuer). The two other options are stainless steel with the sunray anthracite inner dial and a black outer track and a “Racing” model, with a sandblasted titanium case with black titanium carbide coating, and the sunray anthracite / black dial. This Racing model also has a tachymeter scale on the inner bezel. The newest Carrera is powered by the Calibre 36 movement, TAG Heuer’s current version of the El Primero movement. An automatic movement with 31 jewels, the Calibre 36 is a high beat movement, operating at 36,000 vibrations per hour, providing one-tenth second timing and a smooth sweep of the second hand. The rotor is decorated with Cotes de Geneve stripes, with cut-outs to allow extra visibility of the movement. A classic column wheel chronograph, the Calibre 36 is certainly worthy of being displayed. The Carrera Calibre 36 Flyback measures 43 millimeters across the dial and is 15 millimeters thick (measured from the back of the case-back to the top surface of the crystal). The curved sapphire crystal and display crystal on the case-back are both anti-reflective. 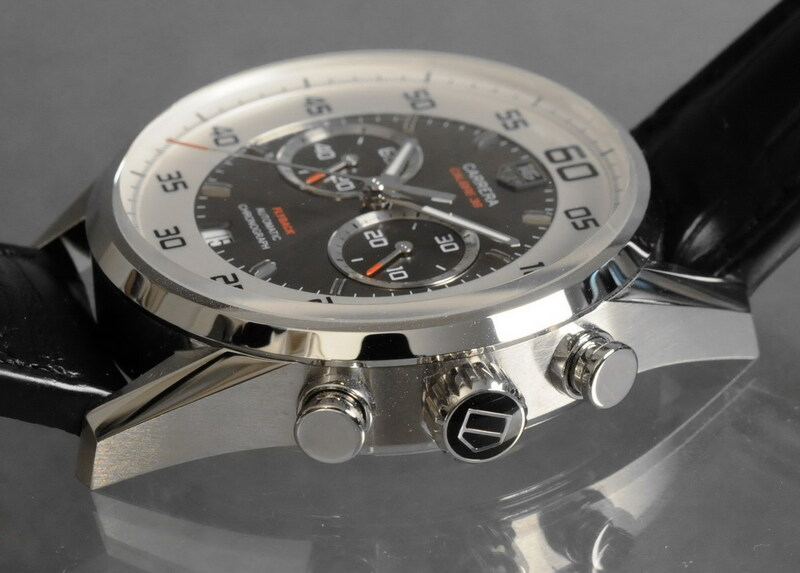 The Carrera Calibre 36 Flyback was launched in June 2013, and is available at a retail price of $7,900. There have been hundreds of models of the Carrera over the past 50 years, with cases in a variety of shapes and configurations. The 1960s Carreras had a unique geometry, however, with the three-faceted horned lugs not used for any other watch, Heuer or non-Heuer. The Carrera Calibre 36 Flyback is true to the geometry of the original Carreras, enlarged from 36 millimeters to 43 millimeters to suit current preferences for larger chronographs. The palette used for the Carrera Calibre 36 Flybacks derives from colors used historically by Heuer and TAG Heuer. 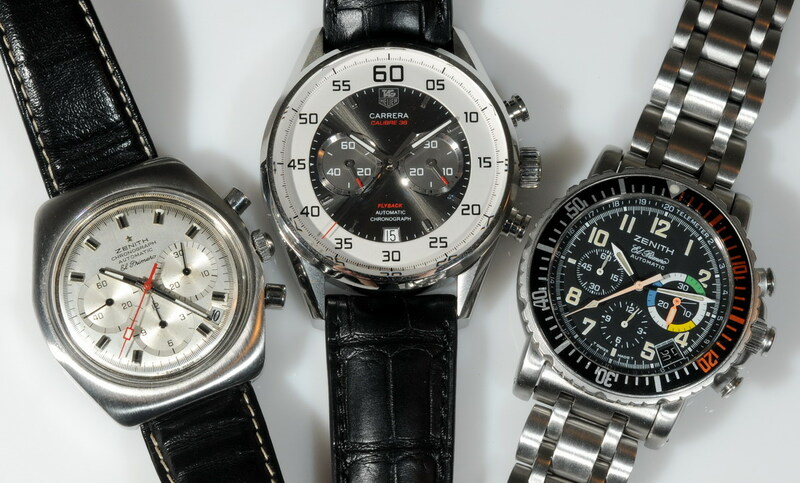 Heuer has been using contrasting registers / dials since the late 1960s (as shown below, on the left); the use of gray (anthracite) with red accents is a personal favorite of Jack Heuer, first seen in 2004, with the 40th Anniversary Carrera (shown below, center). Heuer Carrera from the 1960s, 40th Anniversary Carrera from 2004, and the Carrera Calibre 36 Flyback. There is no mistaking that the Calibre 36 Flyback is a Carrera. The thin bezel and faceted lugs follow the style of the 1960s Carreras, and the side profile of the case also traces the lines of the very first models. This Carrera wears very well for a 43 millimeter watch, fitting comfortably even on a relatively small wrist. With the thin bezel, the dial becomes even more prominent, and the contrast between the dial’s concentric circles gives the newest Carrera a unique look. The outer track is bright and crisp, contrasting nicely with the soft tone of the gray dial. The words I heard most often from people seeing the watch for the first time were “sharp” and “crisp”. I was surprised when a couple of friends asked me how old the watch was, and one proceeded to praise its “retro” look. The Carrera Calibre 36 Flyback provides contrasting elements — the hands, markers and Daytona rings giving it a bright shiny look, while the anthracite gray dial is soft, changing between lighter and darker shades, depending how the light hits it. I have written reviews of a lot of watches, and I can’t recall feeling compelled to comment on a modern crystal, but the crystal on this new Carrera is exceptionally good. The geometry is perfect, and the anti-reflective material enhances the look of the dial. 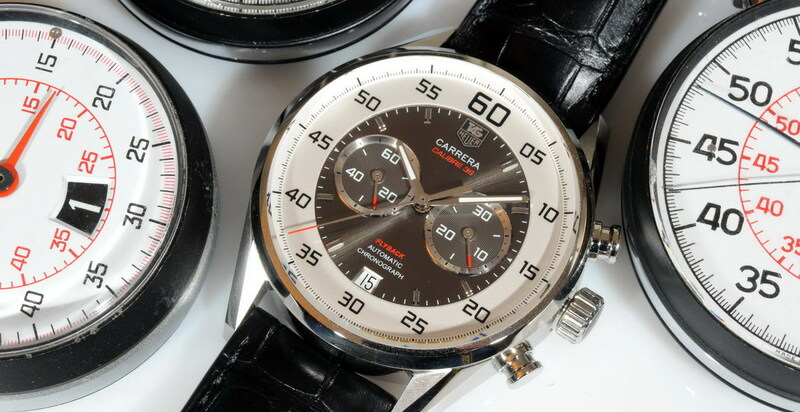 Whereas all the surfaces of the 1960s Carreras were polished, TAG Heuer has used a soft brushed finish on the sides of the Carrera Calibre 36 Flyback. Vintage enthusiasts may do a double-take, but this brushed finish looks right to my eye, an excellent example of a modern brand changing some accents, while preserving the main elements of a classic design. When Jack Heuer came to the United States in 1958, he had one primary objective – to push sales of Heuer stopwatches so that the company’s market share in the massive U. S. market would catch up with its share in other major world markets. 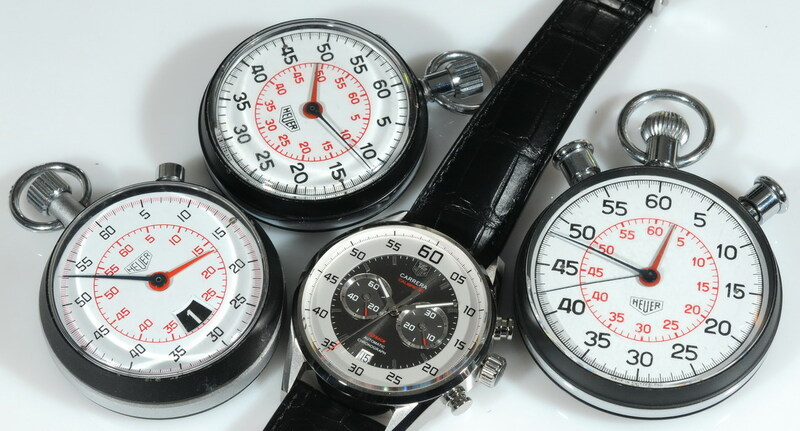 In the U.S., Heuer stopwatches were being sold through scientific and industrial suppliers, with state, local and federal governments also being major customers. But Jack Heuer focused on another market that would prove to be attractive, peddling Heuer stopwatches and related timing equipment to automobile racers and their teams. Yes, given the choice of hanging out with the scientists or the racers, we can understand Jack Heuer’s decision to head for the racetrack. And in the end, TAG Heuer still enjoys the benefits of this decision. In 1960, Heuer redesigned its line of stopwatches, with the new design called the “Century” line, to mark the 100th birthday of the company. The most important change in the Century design involved moving the minute recorder from its traditional position (a small recorder at the top of the dial) to a larger track at the center of the dial. With this, Heuer developed its “dual track” design, with a shorter hand counting the minutes (on an interior track) and a longer hand counting the seconds (on the outer track). Marketing materials from the 1960s proclaim that Heuer’s new lay-out improved legibility by 83 percent. 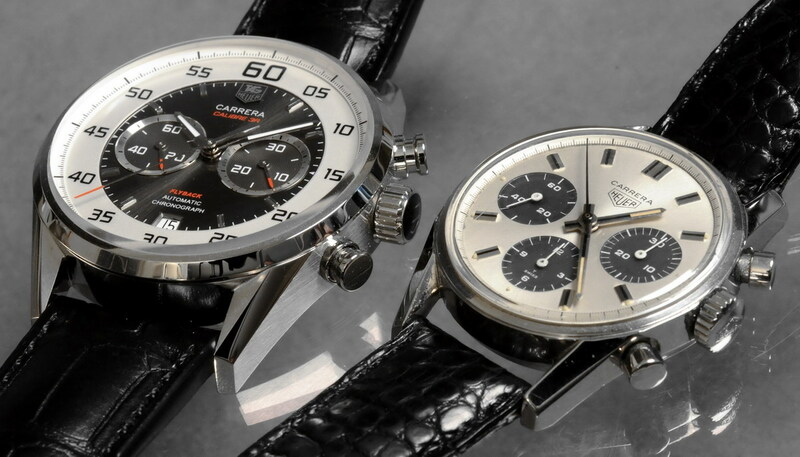 Carrera Calibre 36 Flyback chronograph, with Heuer “Century” style stopwatches, which had been redesigned to mark the 100th anniversary of Heuer, in 1960. 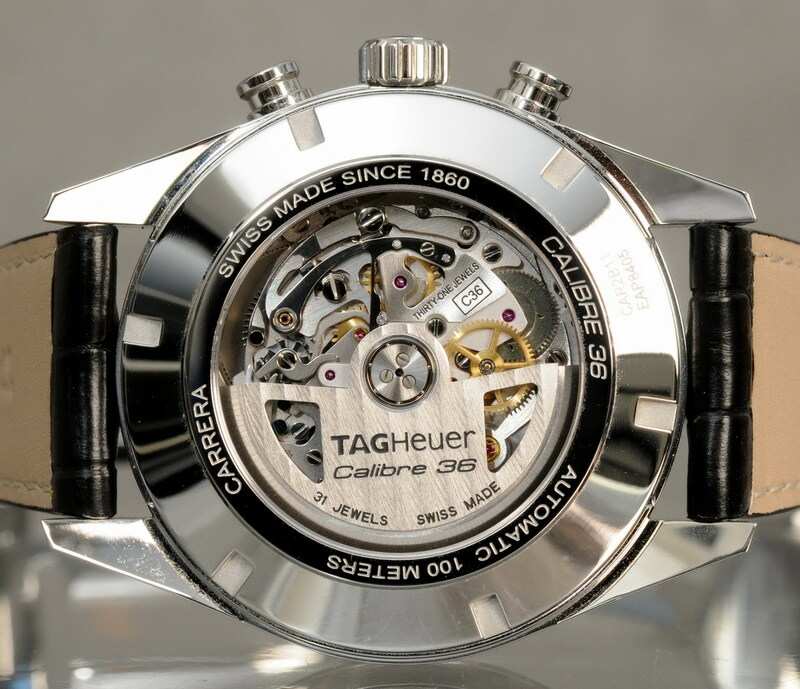 TAG Heuer first used the “stopwatch-inspired” / “dual track” design for a chronograph in 2011, with the Carrera Mikrograph, and since then TAG Heuer has used this design for several of its haute horlogerie timepieces. 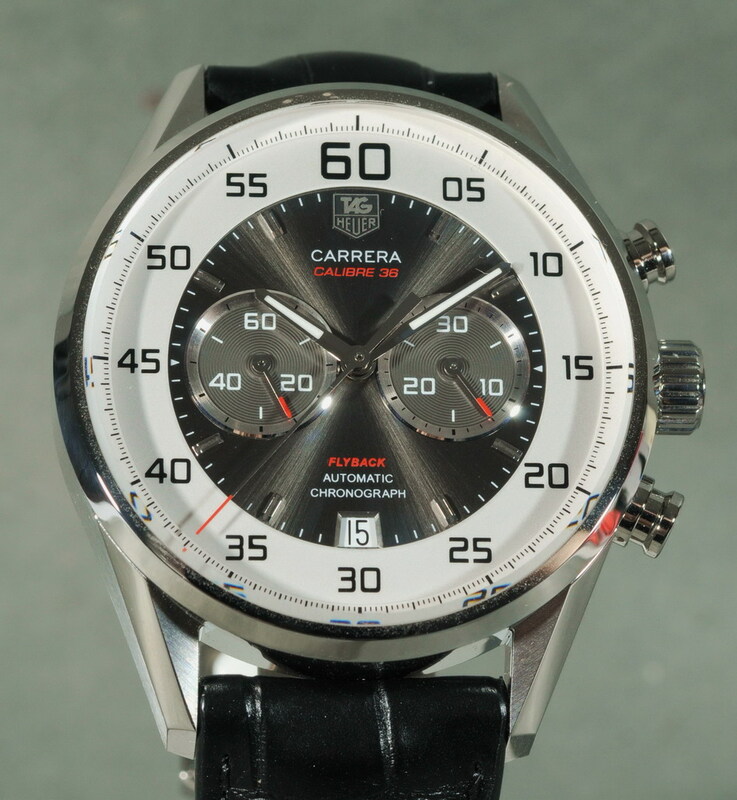 The use of this approach for the Carrera Calibre 36 Flyback represents the transition of this new style from TAG Heuer’s high end into the brand’s mainstream catalog. Introduced in 2011, the Carrera Mikrograph (left) was TAG Heuer’s first chronograph to use a stopwatch-inspired design. I enjoy Heuer’s heritage in race and motorsports timing, and the stopwatch motif of the Carrera Calibre 36 Flyback is a perfect tribute to this heritage. Glancing at the Carrera on my wrist, I saw the unmistakable design of a Heuer stopwatch, but in a form that serves well as a modern chronograph. The same elements that made the Century line of stopwatches fresh and bright in the 1960s make the Carrera Calibre 36 Flyback appealing today. The bright white outer track provides a sharp contrast to the anthracite of the inner dial, with the numerals confirming that for Heuer, legibility has always been the first criterion in design. While there are some chronographs in which the stopwatch feature seems to be almost an afterthought, with the registers softly blending into the dial, the Carrera Calibre 36 Flyback is all about the stopwatch. The design makes the statement that this timepiece is about race timing, with the time-of-day display appearing to be being secondary. Back in 1969, Heuer competed with two other companies – Zenith and Seiko – to introduce the world’s first automatic chronograph. To this day, enthusiasts argue about which brand won the race. Zenith showed the public its automatic chronograph in January 1969, but the watch (called the “El Primero”) was only available to customers in October of that year. Seiko offered its Reference 6139 automatic chronograph for sale in May 1969, but it was offered for sale only in Japan. All seem to agree that Heuer, with its partner Breitling, was first to offer an automatic chronograph for sale in major world markets, with automatic Autavias, Carreras and Monacos in retail channels during the Summer of 1969. Whereas Heuer’s Calibre 11 was as a modular movement, the El Primero (caliber 3019 PHC) was a traditional integrated movement, with a classic column wheel. The movement ran at a high beat of 36,000 vibrations per hour, allowing timing of intervals as short as one tenth of a second. The Zenith chronograph used the customary tri-compax layout for a 12-hour chronograph, with running seconds at nine o’clock and a date window between four and five o’clock. 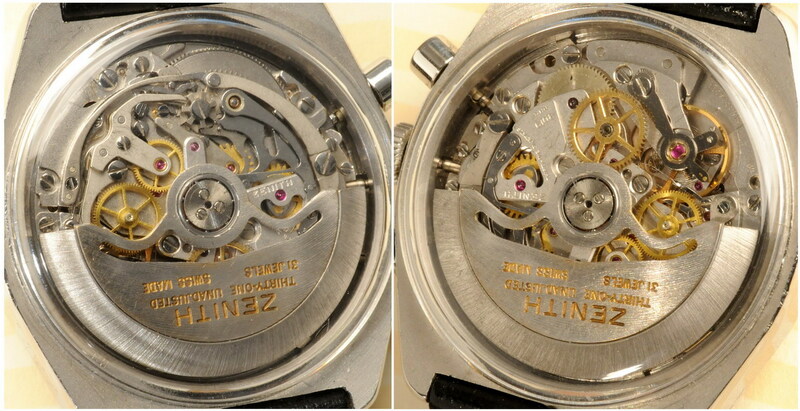 A Zenith El Primero movement, in Reference A 787 chronograph, circa 1970. While enthusiasts may continue to debate the question “which was first?”, there is little argument about which automatic chronograph movement had the most elegant, well-developed design. The Zenith wins this prize, in every discussion. While the Caliber 11 movement from Heuer may have gotten to the market more quickly, most collectors agree that it cannot rival the beauty of the El Primero movement. The original El Primero had a short life, however, being discontinued around 1975, when Zenith shifted its entire production to quartz watches. Zenith came under new ownership in the mid-1980s, and the El Primero movement was re-launched, powering chronographs for the Zenith, Ebel and Boucheron brands, among several others. In 1988, Rolex used a modified version of the El Primero (Caliber 400) to power its first automatic version of the automatic Daytona, with production running through 2000. In 1995, Zenith introduced is “Rainbow” line of El Primeros, named for the 1934 winner of the America’s Cup yacht race. Two years later, the El Primero movement was modified to add the flyback complication. When LVMH, the parent of TAG Heuer, acquired Zenith in 1999, vintage chronograph enthusiasts hoped that the El Primero movement would soon power some of TAG Heuer’s classic models. TAG Heuer has only recently begun using the Calibre 36 movement, however, and this movement powers a limited range of models, including the Monaco 24s, two versions of the Monza, two Grand Carreras and two Link models. The Monaco 24s are massive, with half the recorders covered; the Grand Carreras use a complicated “Caliper Scale Reading”; and the Monzas are cushion cases. 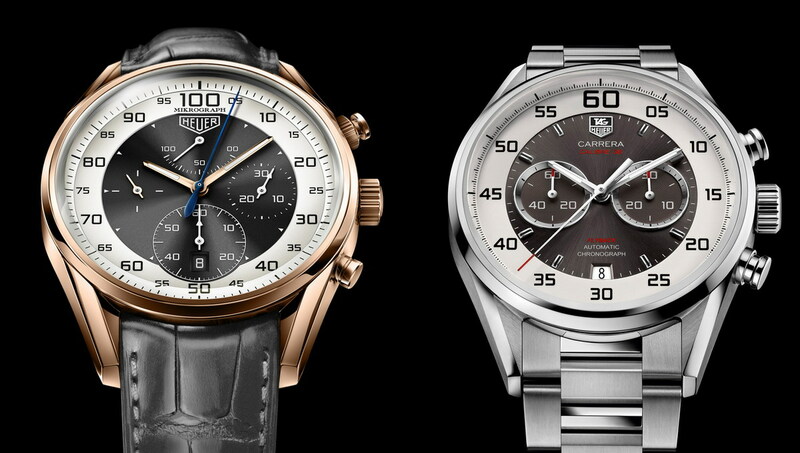 Accordingly, the Carrera Calibre 36 Flyback represents a breakthrough for TAG Heuer, in that the Calibre 36 has made its way into the mainstream of the brand’s classic chronographs, using a conventional design likely to have broad appeal to enthusiasts. As I was showing off the newest Carrera and bragging about its legendary movement, a friend asked, “So why does the movement matter? Aren’t they all pretty reliable nowadays?”. Yes, most of the movements in $7,900 chronographs keep good time and operate smoothly, and the El Primero works as well as any of them. The pushers, the hands reset instantly, and there is a solid feel in winding and setting the watch. Accuracy was within three seconds per day, over the week that I wore the watch. Beyond this baseline of reliable operation, however, chronograph enthusiasts will find pleasure in the fact that this new Carrera is powered by the legendary El Primero movement. Whether the beautiful design of the movement, its place in the history of chronographs, its death and miraculous rebirth, or the sweep of the second hand, there has always been something special about the El Primero movement. Forty-four years after the race to be the first, El Primero enthusiasts can be proud to be the last, with the El Primero being the only movement in the great race of 1969 that is still in production today. TAG Heuer enthusiasts are already embracing the mystique of the Caliber 36 movement, delighted that the legendary movement now powers the Carrera. Indeed, the Calibre 36 movement is the perfect gift for the Carrera, as it celebrates its 50th birthday. Watchmakers tell us that the flyback is a fairly simple complication, involving the addition of only a couple of parts to a standard chronograph. A standard chronograph includes a tab on the reset lever (circled below, in green) to ensure that the chronograph cannot be reset while it is running (engaged). A flyback movement deletes this tab and adds a lever (shown by the red arrows) so that the chronograph can be instantly disengaged (to allow the chronograph to be reset) and instantly reengaged (to continue the chronograph timing after it has been reset). The photo below shows a Valjoux 23 movement, on the left, and a Valjoux 230 flyback movement, on the right, illustrating the parts that differentiate a flyback chronograph from a standard model. Flyback chronographs are usually associated with flying, and particularly chronographs for air force pilots. The pilot must time one maneuver, and at the moment he completes the first maneuver, he starts timing the second maneuver, with no time lag between the timing of these events. Classic flyback chronographs for military pilots have come in several generations. German air force pilots in the 1930s and 40s used flyback chronographs from Hanhart and Junghans. French air force pilots of the 1960s used the Type 20 chronograph, made by Breguet, Dodane, Viza and others. The most recognized military pilots chronograph of the 1960s was the Heuer Reference 1550 SG, supplied to the German Bundeswehr, as well as the air forces of Italy and Norway. 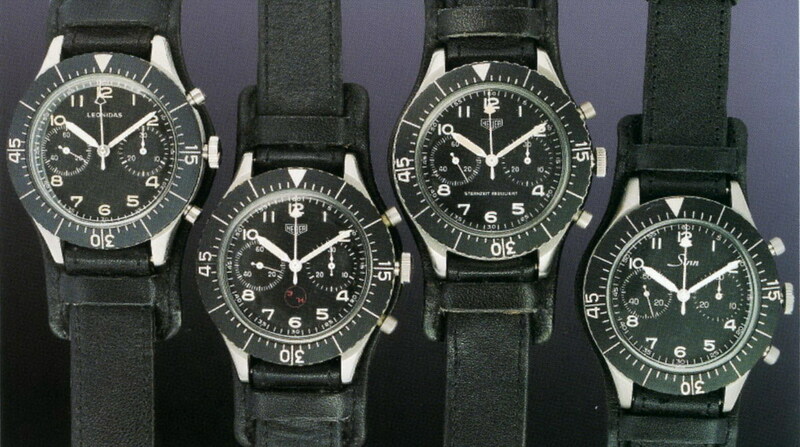 The “Bundeswehr” (German Air Force) flyback chronograph, as produced by Leonidas, Heuer and Sinn. While flyback chronographs are usually associated with military flying, they are also useful for timing laps at the racetrack. The crew or spectator can read the time when a car completes its first lap, while instantly beginning the timing of the second lap. The Carrera Calibre 36 Flyback continues the heritage of pilots flyback chronographs from the 1950s and 1960s. Though designed for pilots and racers, flyback chronographs also prove to be useful in everyday life. The runner may want to capture her splits, checking her time for “Mile One”, just as she starts “Mile Two”. The sprinter wants to time his 400 meter speedwork, as he allows himself no more than 60 second of rest between each sprint. 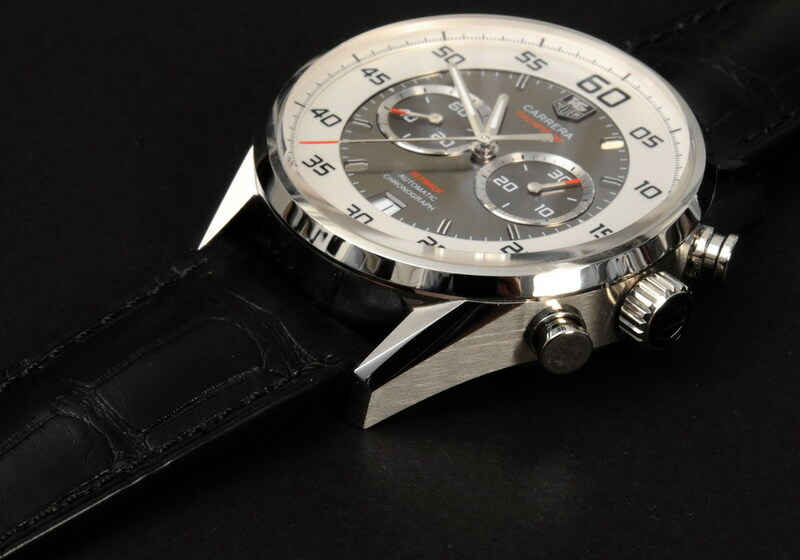 The flyback feature enables the mechanical chronograph to perform such interval timing. As a chronograph enthusiast, I have always marveled at the flyback function. Yes, I am amazed at the reset mechanism of a standard chronograph and to see a flyback chronograph stop, reset and start with a single push appears to be almost miraculous. I admire the technical aspects of the flyback complication, but — let’s be honest – as enthusiasts there is a more important reason that we enjoy wearing chronographs. Many of us wear chronographs because we like to time things. Like a kid on his first 10-speed bike, or an enthusiast taking a sports car through its paces, we enjoy operating a chronograph. During my week with the Carrera Calibre 36 Flyback, I used the flyback to time all sorts of things – the mile markers on my morning commute, speakers at a legal education seminar, and game show contestants who had 60 seconds to answer six questions. The Carrera Calibre 36 Flyback operated flawlessly, with the pushers and movement conveying a sure, reliable feel. Yes, chronograph enthusiasts may enjoy timing things, and the flyback offers an additional capability, which proved to be good fun. A few months ago, I borrowed a Carrera Mikrograph from TAG Heuer, and after wearing the Mikrograph for a few days, I was absolutely smitten with it. The watch evoked many of my favorite moments in Heuer’s history — the original Mikrograph stopwatch from 1916, with 1/100 second timing; the introduction of the first Carrera in 1963; and Jack Heuer presenting 18 karat gold Carreras to the Ferrari Formula One drivers of the 1970s. The sweep of the chronograph second hand, going around the dial once per second and showing 1/100 second increments, symbolized these moments, as well as the drive for accuracy and precision that have defined Heuer’s approach to race timing. Yes, I wanted the Carrera Mikrograph, but knew that its $50,000 price tag placed it well beyond my budget. I wondered whether there might come a time when TAG Heuer would offer a more affordable Carrera that would offer the look and heritage of the Mikrograph. With the introduction of the Carrera Calibre 36 Flyback, we can say that TAG Heuer has delivered a version of the Mikrograph for “the rest of us”. No, it’s not 18 karat gold, and no, it doesn’t offer 1/100 second timing via a dedicated 50 Hertz movement, but just as the Mikrograph captured essential moments in Heuer’s history, so too the Carrera Calibre 36 Flyback captures many of Heuer’s best moments. The stopwatch-inspired style captures the essence of Heuer’s position in the 1960s, the toehold that Jack Heuer used to dominate the motorsports timing market. The flyback came to Heuer in 1964 when it acquired Leonidas, which produced the Bundeswehr pilots chronograph of the 1960s. Forty four years after the creation of the El Primero, the Calibre 36 continues the movement’s brilliant design, reminding us of the historic race of 1969. 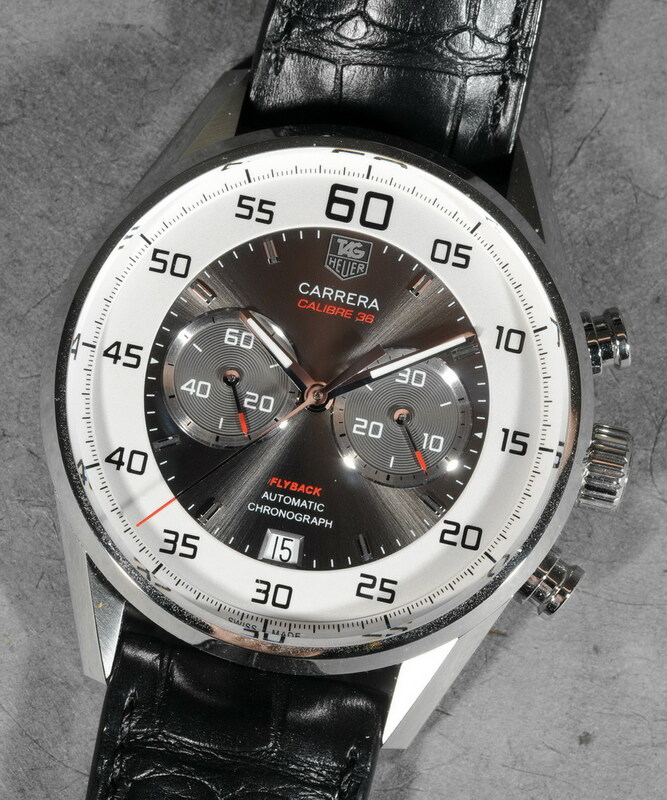 But the Carrera Calibre 36 Flyback is more than a compilation or representation of great moments in Heuer’s history. This chronograph is a beautiful watch that is fun to wear and operate. Only two years after capturing headlines with the Carrera Mikrograph, TAG Heuer is offering a stopwatch-inspired chronograph that will be attractive to those who cherish the TAG Heuer brand and its unique heritage in motorsports. Additional coverage of the Carrera Calibre 36 Flyback chronograph — TAG Heuer’s teaser for the Calibre 36 Flyback and the introduction of the new models at Basel. Coming soon — A Hodinkee video, showing the operation of the Carrera Calibre 36 Flyback and other legendary flyback chronographs.